One of the best things about a “roving retirement” is that I can define what it means for me. When I began my living-abroad journey, it was difficult for me to commit to one place to move to, even with all the research I had done. I had a list of places that I wanted to “try on” first to see which one fit me best. And I had a long list. I also wanted to stay in a city long enough to learn what it’s like to live there…the culture, the people, the food, the history, the unique ways of doing things. In some countries, for example, just buying food at the market is different. In many markets I’ve shopped, the clerk selects and bags your order—the buyer doesn’t touch the produce. One of the best pieces of advice I’ve received is to stand back and watch the locals—a great way to learn and honor their customs. With the goal to stay in each place longer than a nice relaxing vacation, I would also reduce my travel budget. Staying longer in each place would mean fewer trips and airfares. So, my international roving retirement meets my objectives. And that’s what I love about it. It is flexible not only in where I choose to live, but how long. No rules. Except of course, the visa requirements for each country that determine how long I stay. 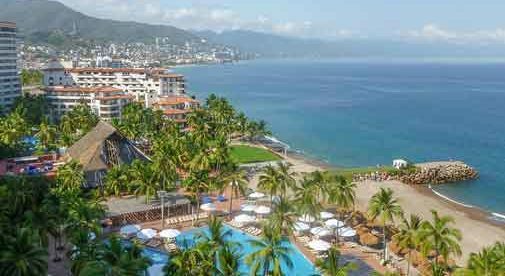 Sitting on my balcony in Puerto Vallarta, Mexico, listening to the rhythmic, steady pound of the waves, I just completed my “international living” plan for 2018. Each of my new homes meets my monthly rental budget of $1,000, which usually includes all utilities and cleaning service. At that price, I get a very nice one-or two-bedroom apartment or condo in a city center or on the beach. There is no doubt I could live for much less with a 12-month lease, but I am not ready to settle down yet. I have too many places yet to see. And at approximately $33 per night, it is still hard to beat. I will begin the year in Greece, spending the first month volunteering at a refugee camp just outside of Athens. I will then spend two months exploring Greece, all from the apartment I have rented in Athens. It’s centrally located so that I can walk to supermarkets and restaurants, and to the city center where many of the ancient monuments and museums are, but it’s also a short walk to the bus for trips to the beach. After Greece, I will take a quick trip home to the states to visit family, and then I’m back across the pond to a country I have always wanted to visit. Ireland had seemed too expensive for me to visit on a vacation, but with some research I have found an amazing apartment in a small seaside village southwest of Dublin—out of reach of the tourist areas, but close to a marina, coastal hiking trails, and amazing Irish pub music. I had little knowledge of Ireland other than, of course, Dublin, so it was an ideal time to try a recommendation I had read about in International Living. A roving retiree had shared her strategy for finding accommodations. In her Airbnb searches, she would set her search criteria to include the entire country, rather than an individual city. She pointed out that this had allowed her to discover smaller towns, gems that would never have been on her radar otherwise. After my two months in Ireland and another quick trip to the States, I will head back to Puerto Vallarta, as I’ve done for five to six months a year the past two years. My stay in Puerto Vallarta is in the “off” season, the hot, humid season for Puerto Vallarta. But with that comes lower prices, an even greater appreciation for my stay by the locals and, sometimes, the swimming pool to myself. And I love it there. With my “international homes” reserved and secured for the next year, I can really relax. I can head to the city center and malecón (boardwalk) to experience the many fiestas that take place; take an early morning walk on the beach in beautiful Banderas Bay; treat myself to an amazing lunch for under $10, which, of course, includes a glass of wine; and absorb the beauty of the breath-taking sunsets in Puerto Vallarta.